I have been taking Essential Fatty Acids for a couple of years now. 2 caps after pregnancy 1 cap now for maintenance. Your body needs a range of nutrients to maintain optimal health. When you think about ways to stay well‚ you might focus on consuming foods like whole grains‚ lean proteins‚ fruits‚ and vegetables. Without question‚ these foods are critical for good health‚ but focusing on your diet alone may shortchange your body. You also need to rest well each night and exercise on a regular basis. Additionally‚ you need essential fatty acids in your diet; they're critical for health but too often overlooked. Essential fatty acids are healthy fats your body needs but can't make on its own. They provide many health benefits‚ including support for the immune system‚ brain health‚ cellular function‚ and hormone production. Some evidence also shows that essential fatty acids may promote cardiovascular health and regulate moods. They may also work to tame inflammation of the joints. Eicosapentaenoic acid (EPA) and docosahexaenoic acid (DHA) are referred to as omega-3 fatty acids. Though you can get them by eating certain types of fish such as salmon‚ tuna‚ and mackerel‚ chances are you don't eat enough of them on a regular basis for the maximum benefit. That’s why a high-quality supplement can help protect and support your health. 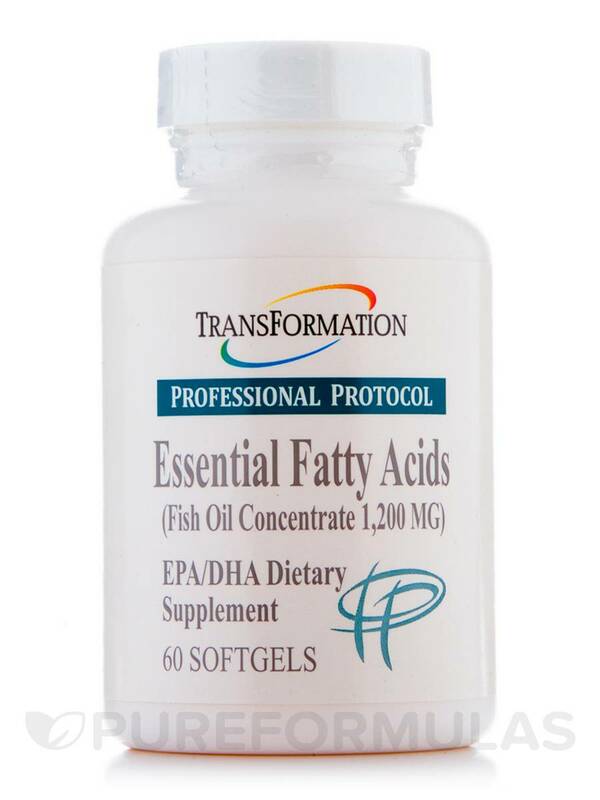 Essential Fatty Acids 1200 mg by Transformation Enzyme Corporation provides high-quality omega-3 fatty acids in an allergen and filler-free capsule. Each softgel capsule provides 360 mg of EPA and 240 mg of DHA. 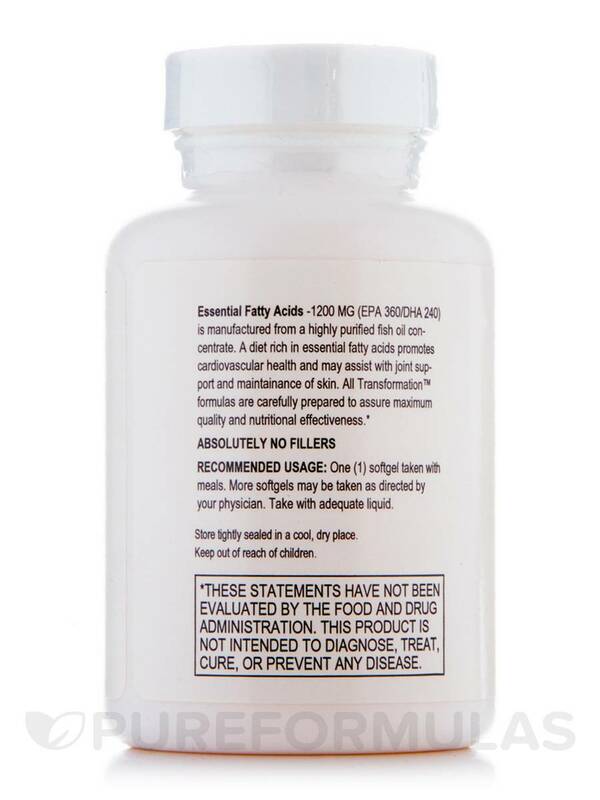 The recommended dosage of Transformation Enzyme Corporation’s Essential Fatty Acids 1200 mg is one softgel daily. 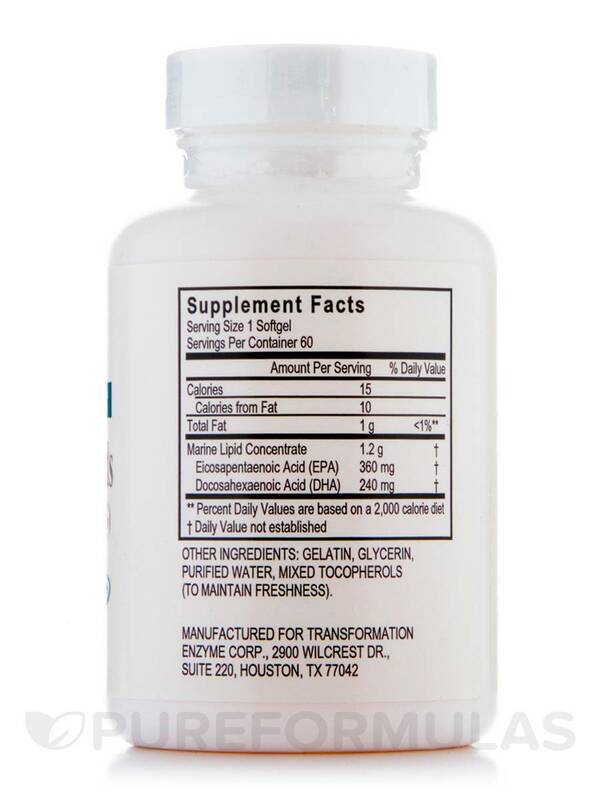 Since each bottle contains 60 softgels‚ each bottle should last for about two months. Gelatin‚ glycerin‚ purified water‚ mixed tocopherols (to maintain freshness). Take one (1) softgel with meals. Usage may be increased according to need as directed by health care practitioner.